Requirements were REVISED effective January 1, 2012.
but BSA reconsidered that action and decided to retain Bugling as a separate merit badge. but a replacement, retaining both badges was released in 2011 to replace it. or by clicking on the individual bugle calls listed below. 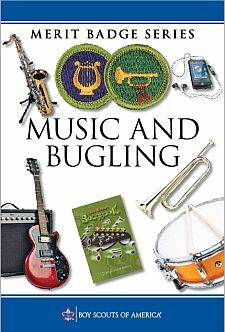 which also has copies of the bugle calls in a number of formats, including WAV files by a professional bugler. The bugle calls from that page can also be accessed from the individual bugle call pages linked below. Explain and demonstrate how the bugle makes sound, and explain how the bugle is related to other brass wind instruments. Compose a bugle call for your troop or patrol to signal a common group activity, such as assembling for mealtime or striking a campsite. Play the call that you have composed before your unit or patrol. Serve as bugler in your troop for three months. NOTE: A bugle, trumpet, or cornet may be used to meet these requirements.